After 11 months I finally cashed in my 2 free member tickets that came with my First Avenue membership. Considering these tickets retailed for $32.50 a piece and my membership was $75, I'd say it was well worth the purchase. 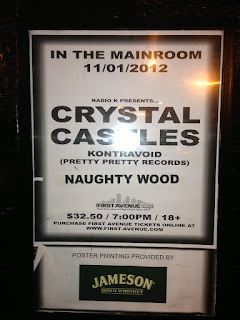 The last, and first time, I saw Crystal Castles was at Lollapalooza 2011. That performance made me a fan, and ensured I'd see them anytime they came through town. So imagine my excitement when I found out they were coming to First Ave, AND I could see them for free. I started out the packed show on the floor, which was a great spot for viewing. It also happened to be a great spot to be bumped, shoved, and pushed. Needless to say, I moved. I retreated to the 2nd floor, which was more open, and more importantly next to the bar. Still a great view, but more enjoyable. The duo put on a fantastic show. It was loud, loud, and thrilling to watch. I loved seeing Alice Glass climb out onto the audience to drink from a bottle and spit it into the crowd. Great show to watch, great songs to hear, and I can't wait for them to come back.